While Microsoft Excel provides an array of functions to work with days, months and years, only one is available for weeks - the WEEKNUM function. So, if you are looking for a way to get a week number from a date, WEEKNUM is the function you want. In this short tutorial, we will briefly talk about the syntax and arguments of Excel WEEKNUM, and then discuss a few formula examples demonstrating how you can use the WEEKNUM function to calculate week numbers in your Excel worksheets. Serial_number - any date within the week whose number you are trying to find. This can be a reference to a cell containing the date, a date entered by using the DATE function or returned by some other formula. Return_type (optional) - a number that determines on which day the week begins. If omitted, the default type 1 is used (the week beginning on Sunday). Here is a complete list of the return_type values supported in WEEKNUM formulas. System 1. The week containing January 1 is considered the 1st week of the year and is numbered week 1. In this system, the week traditionally starts on Sunday. System 2. This is the ISO week date system that is part of the ISO 8601 date and time standard. In this system, the week starts on Monday and the week containing the first Thursday of the year is considered week 1. It is commonly known as the European week numbering system and it is used mainly in government and business for fiscal years and timekeeping. All of the return types listed above apply to System 1, except for return type 21 that is used in System 2. Note. In Excel 2007 and earlier versions, only options 1 and 2 are available. 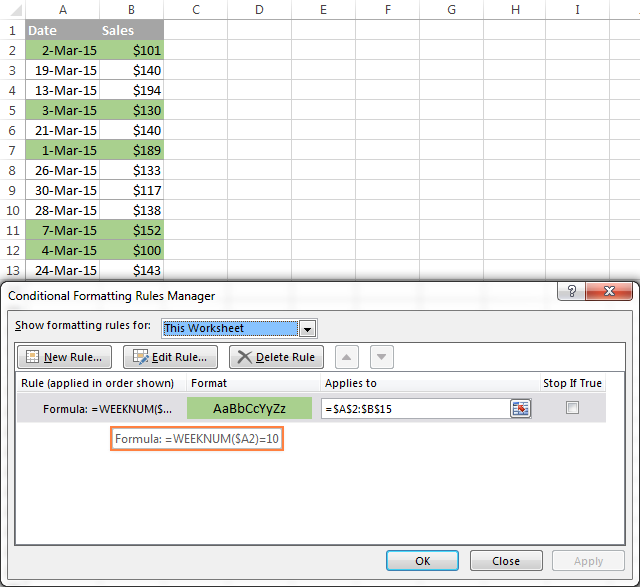 Return types 11 through 21 are supported in Excel 2010 and Excel 2013 only. In the above formula, the return_type argument is omitted, which means that the default type 1 is used - the week beginning on Sunday. The above formula returns 16, which is the number of the week containing April 15, 2015, with a week beginning on Monday. In real-life scenarios, the Excel WEEKNUM function is rarely used on its own. Most often you would use it in combination with other functions to perform various calculations based on the week number, as demonstrated in further examples. 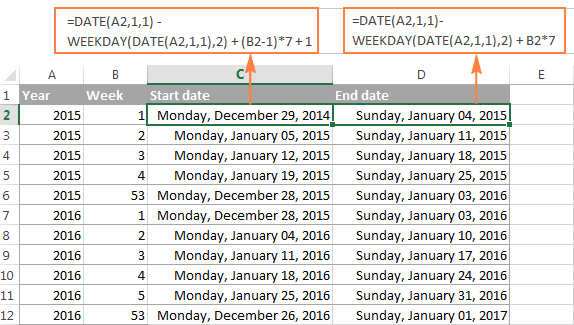 As you have just seen, it's no big deal to turn a date into a week number using the Excel WEEKNUM function. But what if you are looking for the opposite, i.e. converting a week number to a date? Alas, there is no Excel function that could do this straight away. So, we will have to construct our own formulas. Supposing you have a year in cell A2 and a week number in B2, and now you want to calculate the Start and End dates in this week. Note. This formula example is based on ISO week numbers, with a week starting on Monday. Where A2 is the year and B2 is the week number. Of course, the formula to convert a week number to a date is not trivial, and it may take a while to get your head round the logic. Anyway, I will do my best to provide meaningful explanation for those who are curious to get down to the bottom. DATE(A2, 1, -2) - WEEKDAY(DATE(A2, 1, 3)) - calculates the date of the last Monday in the previous year. B2 * 7 - adds the number of weeks multiplied by 7 (the number of days in a week) to get the Monday (start date) of the week in question. In the ISO week numbering system, week 1 is the week containing the first Thursday of the year. Consequently, the first Monday is always between December 29 and January 4. So, to find that date, we have to find the Monday immediately before January 5. 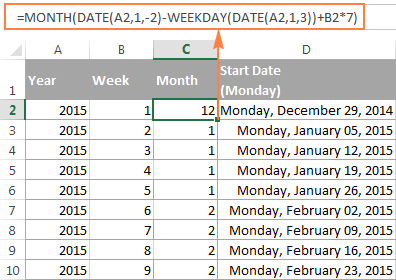 Obviously, you can wrap the Start date formula in the Excel MONTH function to get a month corresponding to the week number. Note. Please remember that the above formula works based on the ISO week date system, where the week starts on Monday and the week containing the 1st Thursday of the year is considered week 1. For example, in the year 2016, the first Thursday is January 7, and that is why week 1 begins on 4-Jan-2016. If the above formula based on the ISO week date system does not meet your requirements, try one of the following solutions. These formulas are similar to the above ones with the only difference that they are written for Sunday - Saturday week. While the previous formulas return Monday (or Sunday) of week 1, regardless of whether if falls within this year or the previous year, this start date formula always returns January 1 as the start date of week 1 regardless of the day of the week. By analogy, the end date formula always returns December 31 as the end date of the last week in the year, regardless of the day of the week. In all other respects, these formulas work similarly to Formula 1 above. 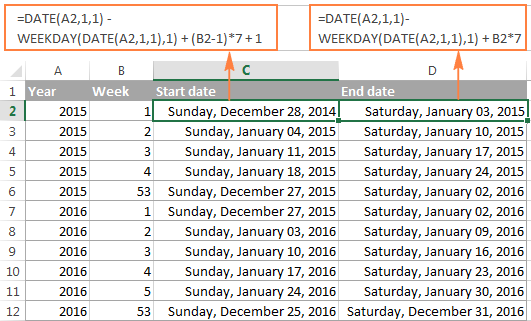 Now that you know how to convert a date to a week number in Excel, let's see how you can use week numbers in other calculations. Suppose, you have some monthly sales figures and you want to know the total for each week. To begin with, let's find out a week number corresponding to each sale. 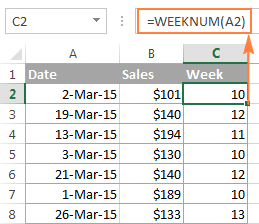 If your dates are in column A and sales in column B, copy the =WEEKNUM(A2) formula across column C beginning in cell C2. Where E2 is the week number. If the helper column with the WEEKNUM formula does not fit well into your data layout, I regret to tell you that there is no simple way to get rid of it because Excel WEEKNUM is one of those functions that doesn't accept range arguments. Therefore, it cannot be used within SUMPRODUCT or any other array formula like the MONTH function in a similar scenario. As demonstrated in the screenshot below, the rule highlights sales that were made within week 10, which is the first week in March 2015. Since the rule applies to A2:B15, it highlights values in both columns. 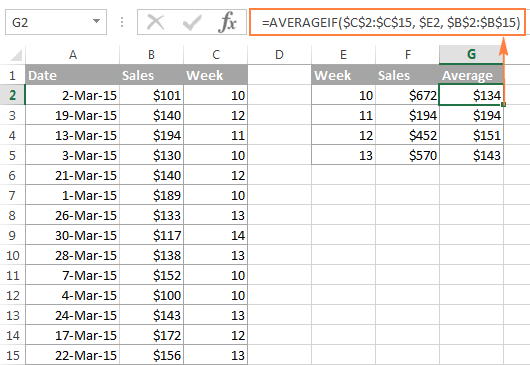 You can learn more about creating conditional formatting rules in this tutorial: Excel conditional formatting based on another cell value. 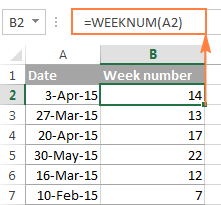 This is how you can calculate week numbers in Excel, convert week number to date and extract week number from date. Hopefully, the WEEKNUM formulas you have learned today will prove useful in your worksheets. In the next tutorial, we will talk about calculating age and years in Excel. I thank you for reading and hope to see you next week! 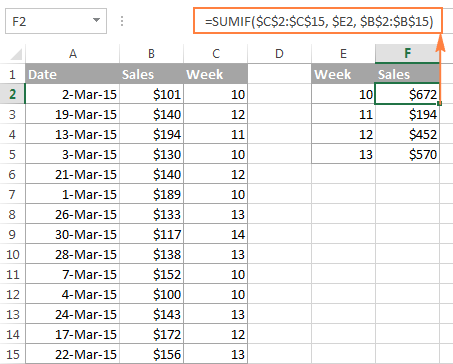 55 Responses to "Calculating week number in Excel (WEEKNUM function)"
Is it possible to use this function but have the week numbers start 1st July in the year? To match our financial year that we use here in Australia. One of the formulas above didn't work for me on dates in 2016. I was seeking a formulas that would tell me for today's date (or any date) what is the first day of the week, base on a Sunday - Saturday week. If you want to start your week on a Monday then remove that -1 at the end of the formula. how to display the current week (like week1, week2, week3 and so on) for a day in a month? You are probably talking about the formula that converts week number to date. Please note that it works based on the ISO week date system, where the week containing the 1st Thursday of the year is considered week 1. In 2016, the first Thursday is January 7, and that is why the week beginning on 4-Jan-2016 is considered week 1. I understand that it may be confusing and this approach may not work well for your date system. Therefore, we have added a few other formulas under Other ways to convert week number to date in Excel that treat the week containing the 1st of January as week 1. How do i convert weekday(Monday, Tuesday,Wednesday...) to date of the year e.g lets say i have week number 2 in one cell and Year 2016 in another cell. How can i find the date of Saturday? but in year 2016, i want it to ignore Jan 1 and 2 (which is taking as by default week=#1). Expecting output for Jan 3 - 9 as week #1, Jan 10 to 16 = week #2 and so on. Please keep in mind this specific formula is only for year 2016 (as per your requirements), and it won't work correctly for other years. thanks for quick response, could you please confirm what is the B7 here? or is it possible to send me the excel screenshot or the excel file you used for writing this formula? to my email id? And thanks in Advance again. I have a similar question of Abid's. I hava a column A:A with dates from 01/01/2015 until 31/12/2020, and the column B:B will have the week numbers, considering the topmost row with data: 2. I want to know the week number considering the switch of years. For example: if I have dates from 28/12/2015 to 31/12/2015 as week 53, I have to consider dates 01/01/2016 until 03/01/2016 as week 53 as well to complete a full week (7 days). So, week number 1 for the year of 2016 will only start on 04/01/2016, and so on. Could you please help me out, answering through my e-mail or through this page? How do I keep the cell with the weeknum formula blank if no date is entered in the reference cell? Thanks Svetlana. It works. You made my day. How do I create a formula that returns the week of the month where the week of the month always starts on the 1st day or the month(no matter the day of the week) and ends on the last day. Following the 1st day of the month the week begins on Monday. Ha...figured it out right after posting this comment. I need to a formula to calculate the date of the beginning of the week starting Monday. So if I look at 7/7/2016 I want the formula to produce the date of Monday in the same week which would be 4/7/2016. I need help on one logic to create one function for the date. I found what I think is the easiest way to convert a date to its preceding Monday (first day of week). Its also easily adjustable to find preceding Sunday. WEEKDAY(cell,3) returns number from 0-6 for days Monday-Sunday, simply subtracting that from a given date will result in the preceding Monday. You get the last day of week with same formula adding 6. Once again I'm the ONLY human on the ENTIRE PLANET who wants to have a cell with a Mon-Sun in date format in ONE CELL!!!!!! It's so awesome blazing the trail for humanity! No, it's really not because I have NO IDEA how to do this!!!! Why oh why am in this computer hell paradigm?????? Daniel, you are not alone. I am looking for the same thing!! I want a single cell to show Monday-Sunday as ##/## to ##/##. I already have a weekly project schedule created so I know what needs designed for which event. I don't want to mess the whole thing up by adding new columns and messing the whole thing up!! I'm trying to use the WEEKNUM() function on a defined name and having some difficulty. My defined name plannedDate refers to a cell range containing only date formatted cells. I want WEEKNUM(plannedDate) to return the week number, but I am getting some sort of error. For reference, MONTH(plannedDate) returns the correct value between 1 and 12. How to the week number and year? Example : 8/11/2016 to CW45'16. Is there a simple formula to display the Sunday date two weeks prior to today's date? So if today is the 6th Jan i would want the formula to show the date of the 26th December. So no matter what day the sheet is on this week it will always show that Sunday until the date changes to the first date of the next week. This make sense? I was thinking =today()-14. however this would not show the Sundays date unless it was exactly 14 days prior. Solved my life - Thank you very much. Muchas gracias. weeknum= 2 and day is Sunday for every month. How to convert to date ? Great article. The screenshots with detailed captions makes it awesome and super easy to read/understand. Thanks for sharing your wisdom. I've done the weeknum. However, may I know how do I make the column update automatically when the date updates? Because keep having to drag it down to update is a hassle. Thank you! However, when I get to the previous year I can't figure out how to return Week# 52 and prior. I've tried several different formulas but always end up with Week -1 and so on. Any ideas? =DATE(A2,1,-2) << I just checked this, it receives the last tuesday of the previous year, and not the last monday. Very good ideas and much helpful us. many thanks for useful info. I have data set with First date as 6-Sept-2018. I need to have 6 Sept to 12th Sept as Week 1, 13th Sept to 19th Sept as Week 2 and so on..How should I write the formula? I need a excel formula to do a weekly planning and should change the weeks automatically if it exceeds week 52 to week 1 ( if the plan ends somewhere next year) . Also the weekly planning will be linked to the date at the beginning as a reference . The planning start date is 07/03/2019 later it will become to =weeknum and the plan buildup in weeks to chase / followup weekly.